Want to maximize the efficiency of your work force even more? We designed the Wrap-Around Parapet Scaffold so your crew can simultaneously work along both sides of the bridge and underneath it, too! It's the easiest way to get close up to inspect for deterioration and rust conditions. When your crew is sandblasting or stripping a bridge with an overhang, or removing forms on bridges under construction, the Extended Parapet Scaffold positions the work deck right where it needs to be. Not only does it assemble in minutes, it packs up fast and is compact for easier storage, too. And for parapet and rail bridges with diaphragms, stiffeners and lateral braces that keep the scaffold from rolling the length of the bridge, there's a solution. 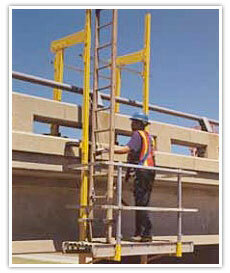 The Rolling Cart with Work Platform lets you traverse the length of the bridge with minimal effort.